For more promotions check our PlayersOnly promotion page. PlayersOnly Poker is a cake network member, one that is supposedly growing faster than the other sites on the network. In the post-UIGEA online poker world, PlayersOnly poker has undertaken an unprecedented marketing approach: it only accepts US players. Whether that’s the key to its success or not remains to be seen, one thing is certain though: PlayersOnly Poker is steadily increasing its active player base. Being part of a group which owns an online casino and a sportsbook, PlayersOnly gets traffic from the casino and sports betting pages as well. This usually means good, loose competition and nice value for seasoned players. The cake network usually offers some extremely juicy games, so if you add that to the above described factors, you’ll get the makings of a pretty good deal. PlayersOnly Poker utilizes the battle tested Cake software, so if you ever played at other Cake sites, you’ll find the whole thing familiar. From a graphics-perspective, the software is OK. Graphics are clean, although they do tend to be a little overcrowded. Graphics don’t eat up of lot of your computer’s processing power, so they will not slow the software down. The statistics offered are the same every other online poker room offers too. You’ll find your usual flops seen %, avg. pot size etc, as well as a hand history function which saves the hands you play to a location which you can define on your own hard-drive. Multi tabling is supported at 10 tables simultaneously, and it doesn’t slow the software down one bit. The in-game stats represent a very useful addition, and the sounds as well as the graphics can be customized. Overall: it’s a tight little package developed with the help of professional poker players and it’s more than satisfactory form every angle. New players are entitled to receive a 100% match on their deposits up to a maximum of $650. This money will be transferred to players’ bonus accounts from where they’ll only have it transferred to their real money accounts once they unlock it. You’ll have to use a bonus code (POKERSTOP) upon sign-up, to get the money transferred into your bonus account. Bonus redemption is done through real money cash or tournament play. You’ll earn FPPs (frequent player points) by playing at these tables. Here’s how it works: for each dollar that is raked off a hand you participate in (it’s not your actual rake contribution, it’s the total rake taken off the pot), you receive an FPP. Each of these FPPs is worth $0.06 in bonus money. Once you accumulate enough FPPs to have $10 of your bonus released, you’ll get that $10 batch transferred from your bonus into your real money account. You will unlock your bonus in such $10 batches. For tournament play, you’ll get 7 FPPs for every $1 you pay in tournament fees. Partial FPP increments are awarded too (for $0.5 paid in tourney fees, you get 3.5 FPPs). If you secure another bonus on top of the sign-up one, you’ll have to redeem your sign-up bonus before you can start unlocking the other bonus. Your bonus is valid for 90 days, which should be sufficient time for you to have it all redeemed. 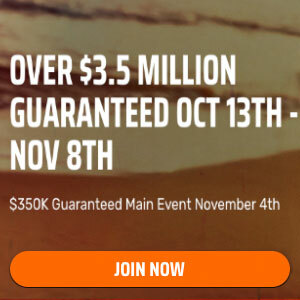 PlayersOnly Poker has plenty of tournaments with buy-ins as low as $0.25 and as high as hundreds of dollars. PlayersOnly runs tournaments in other poker variants too, not just Texas Holdem. They currently have a $50,000 weekly flagship MTT and a $100,000 monthly MTT which already attract nice traffic. As player numbers rise, PlayersOnly Poker keeps adding more and more tournaments to accommodate the player base. There are around 6,000 players at PlayersOnly tournament tables, so you’re bound to find action any time on any buy-in level. There’s some excellent value in this poker room’s re-buy and add-on tourneys. STT-wise, there’s plenty going on at PlayersOnly. STTs start up as soon as they fill and they feature all sorts of buy-ins, from a few dollars up to hundreds of dollars. PlayersOnly Poker only accepts players from the US and Canada. As weird as this approach may seem in a post-UIGEA world, it appears to be working just fine as their player base is continuously growing. PlayersOnly does accept some payment methods from US players other US facing online poker rooms don’t. Another special offer at PlayersOnly is the overall soft and juicy action. Because of the players coming over to play poker from the casino tables and the sports betting pages, the quality of the competition is excellent at PlayersOnly poker. PlayersOnly offers regular freerolls and their Freeroll into Millions Series is one of a kind. As a matter of fact, US and Canadian players are all they accept. No Europeans or pesky Scandinavians here to ruin the fish factor. The whole setup is a little bit tricky though, because there are certain US states that PlayersOnly does not accept players from. Under these circumstances, I reckon there’s not much point in talking about how the UIGEA and other anti-poker laws have affected PlayersOnly Poker’s player base. PlayersOnly Poker has taken the next step in player support as well. While they do offer phone support for all those urgent problems and email based support for those not-so burning issues, they also have live chat support – something which not many sits can boast, despite its obvious and multi-faceted advantages. The support staff at PlayersOnly seems knowledgeable and the answers they provide are to the point and efficient.